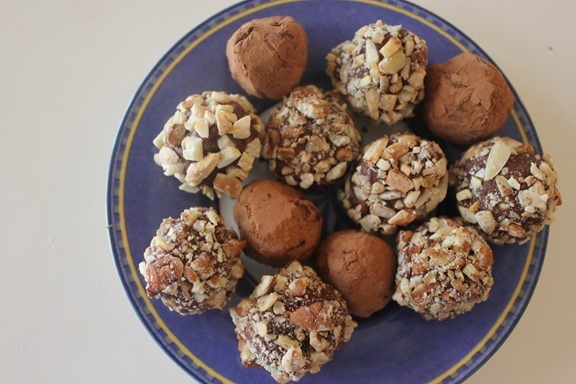 These luscious truffles are only 73 Calories apiece and get only 16% of their calories from carbs…this makes them a great Paleo snack. Use raw chocolate and get way more anti-oxidants! Raw chocolate can promote cardiovascular function & health- The antioxidant power of flavonoids and essential minerals and vitamins found in cacao can support healthy heart functioning by lowering blood pressure, improving blood flow, lowering LDL cholesterol, and reducing plaque buildup on artery walls. Raw chocolate Can Neutralize free radicals- High levels of antioxidants protect the body from a buildup of free radicals from sun exposure, pollution, cigarette smoking, etc., which may damage healthy body tissue giving rise to cancer and cardiovascular disease. Lightly coat 8-inch baking dish with butter. Make parchment sling by folding 2 long sheets of parchment (or non-stick foil) so that they are as wide as baking pan. Lay sheets of parchment in pan perpendicular to each other, with extra hanging over edges of pan. Push parchment into corners and up sides of pan, smoothing flush to pan. Microwave chocolate in medium bowl at 50 percent power, stirring occasionally, until mostly melted and few small chocolate pieces remain, 2 to 3 minutes; set aside. Microwave coconut cream in measuring cup until warm to touch, about 30 seconds. Stir honey, vanilla, and salt into coconut cream and pour mixture over chocolate. Cover bowl with plastic wrap, set aside for 3 minutes, and then stir with wooden spoon to combine. Stir in butter, one piece at a time, until fully incorporated. For coating; Sift cocoa and sugar through fine-mesh strainer into large bowl. Sift again into large cake pan and set aside. If using nuts, crush them up. Gripping overhanging parchment, lift ganache from pan. Cut ganache into sixty-four 1-inch squares (8 rows by 8 rows). (If ganache cracks during slicing, let sit at room temperature for 5 to 10 minutes and then proceed.) Dust hands lightly with cocoa mixture to prevent ganache from sticking and roll each square into ball. Transfer balls to cake pan with cocoa mixture and roll to evenly coat. Lightly shake truffles in hand over pan to remove excess coating. Transfer coated truffles to airtight container and repeat until all ganache squares are rolled and coated. Cover container and refrigerate for at least 2 hours or up to 1 week. Let truffles sit at room temperature for 5 to 10 minutes before serving.